i baked green tea cupcakes a few days ago! i had a weird craving for them even though i'd never tried them before. i mean, i had heard about them and they just sounded like they'd taste good, so i thought i'd attempt to make a batch. they're more muffin-like and have a light green tea flavor, but i wish the tea flavor had been stronger. my fault--i was just experimenting. it's pretty much a basic white cake recipe with some green tea thrown in, and pretty powdered sugar on top for some decoration. 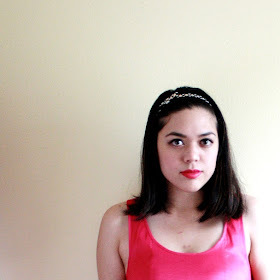 here's an outfit from a few days ago (i'm a bit behind on posting these). the weather has been a little schizo lately (hot, then rainy, then cold, then rainy again, then warm...) but it seems to be settling into spring. it's actually kind of nice and i'm looking forward to wearing warm-weather clothes! plus, i got to wear my new jumper (don't worry, it has shorts underneath! they're just hard to see). 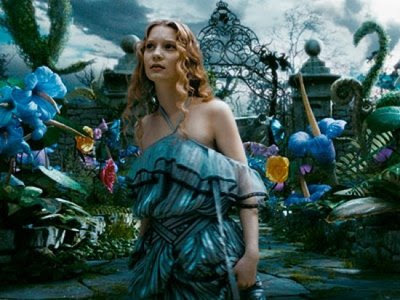 i finally saw 'alice in wonderland' with my sister. i can understand the so-so reviews, but visually & stylistically, i LOVED it! and i read the book just the night before to prepare for it. there are many references to the original story in the new movie, but the plot was a lot different and not what i expected at all...but overall, i enjoyed it a lot. i can't stop thinking about the costumes and have been looking for articles and pictures of colleen atwood's concept art/designs, but i can't find that many. at least not yet. i also saw pictures of the licensed costumes for halloween, but they look a little cheap to me. anyone else see it yet? how did you like it?